There are always paths in front of us, paths that gradually spread out far from one another. At the start you don't notice much difference in choosing one path over another. 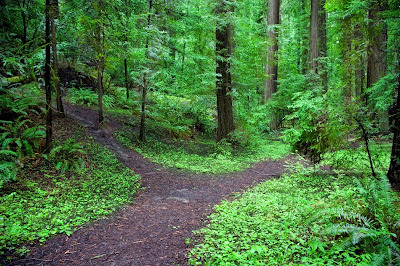 You pick a path, you make a choice, you follow a decision, and in the end it makes you. I have always wanted to grow the artist in me, the creative side of me. I tried learning musical instruments. I tried learning to draw. I tried poetry. I tried joining a singing group. Only poetry worked out fine. And so for 12 years now I have been writing, both poems and prose. I treat my writings like a photo album, to show me how I have changed over the years and to capture the ideas I have. But it has a dark side. When I started it wasn't so obvious. I had lots of school work and no very close friends. Writing a poem took between 2 hours and 2 months. I would flip through dictionaries looking for the right words, and it takes between 10 mins and 2 days. I would think of almost nothing else. I would bury myself in many unrelated books, just to find a spark. I would spend a lot of time, reading and sleeping (to be in my most creative mood, which is the mind-state I'm in before I fall asleep and immediately I wake up) just to write a poem of 30 lines long. It never bothered me. I was getting compliments from the people I showed them to and made some money selling a few poems and articles. But it formed in me a terrible habit. I got used to being buried in lots of information. Ordinarily, it's not a bad thing except that I don't review those information (and worse, when they are emails or SMSs I don't reply). I read things (everything) just to search for a spark. I find it hard to read things in a very personal and responsive way (with the intention of replying or forming an opinion). For every article I write there are many ideas of what I could have written. I am always filled with ideas of what to write. I am always having too much content to pen down and too little time to type them out. So I subconsciously withdraw from activities that deny me the premium time to write or read. And the usual victims have been replying to my mails, messages and having conversations. They require me to read things in a personal and responsive way which I'm not so used to. And then I have to come up with a reply even when I have nothing to say. Biggest of all, I have to fight the subconscious pull to write the articles and books always in my head, a pull that is strongest when I am reading emails or at my PC. And that is the dark side of the path to creativity I followed.